For the Irish radio and television presenter, see Gay Byrne. Gabriel James Byrne (born 12 May 1950) is an Irish actor, movie director, movie producer, writer and audiobook narrator. In 2008, Byrne won a Golden Globe Award. In movies, he is known for his roles in Excalibur (1981), Miller's Crossing (1990), The Usual Suspects (1995), Stigmata (1999), End of Days (1999), Spider (2002), Jindabyne (2006), Vampire Academy (2014) and The 33 (2015). Byrne co-wrote The Last of the High Kings (1996). Byrne has also produced several movies, including the Academy Award–nominated In the Name of the Father (1993). In television, Byrne is known for his role as Paul Weston in the HBO drama In Treatment (2008–2011). ↑ English, Eoin (7 August 2014). "Gabriel Byrne's secret wedding finalised over coffee and scones in popular Cork restaurant". Irish Examiner. Retrieved 15 June 2015. 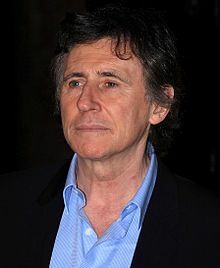 "Star Bio's: Gabriel Byrne". Archived from the original on 13 March 2007. This page was last changed on 21 April 2018, at 06:36.